Copied and paste from Rotax Owner. Good info from Bill Hertzel. Power delivered by a fixed pitch propeller will be proportional to the Cube Root of the RPM. Assuming your WOT Full Power RPM is the 5800rpm Max of the engine, 5800 * 0.91 ≈ 5275 RPM. At 1800rpm you are producing <3hp and can just barely taxi. The ≈ 4300rpm shown in the engine performance charts show that an engine operating at WOT and loaded down to 4300 rpm will be producing 75% of full power. This would be a severely overloaded engine and not something you would ever want to do except on a Dyno Test stand, and only for a very brief time at that. For comparison sake, if you removed the prop and ran the engine up to 5800 without a propeller to load it, you would be just barely over idle HP and not anywhere near the 100HP the performance chart would seem to indicate. The Engine Performance charts only apply to an engine running at Wide Open Throttle (WOT) and loaded to the RPM levels indicated. The Torque value is quickly measured by the Dynometer and along with the RPM indicated at that point, the Power is calculated. The Marketing department asked the Engineers for something impressive to print in the sales brochures and this is what they got! It is an Engineering Design Planning Chart and not something to refer to for daily operational information. This is useful information. Thanks. One small correction: The word "root" should be stricken from the 5th and 6th lines. The calculations shown are based on delivered power being proportional to the "cube" of rpm, not the "cube root". Cube root doesn't make any sense - we would get almost the same power at any rpm. By the way, I think you're right that the ROTAX power curves assume a wide open throttle and an engine loaded to achieve the specified speeds. As you point out, if you pull the prop off it certainly won't generate anything close to 100 hp at 5800 rpm. Cube of rpm doesn't make any sense...5000rpm cubed is 125,000,000,000...not a number that relates to power delivered in any way. I think the correct use here is the cube root of the power percentage, multiplied by max rpm, will give the rpm at which that power percentage occurs. That's how Roger used it above and that math works. I think it was just slightly misstated as "rpm" instead of "percentage of power" in the original post. I have used this chart since 2006. Its how I've known that within the 5,500 limitation that 5,500 is where best power / speed / climb is and within the redline it becomes 5,800. Its how I've known that less than 93% power is available to us max within the limitation. Its how I've know there is no benefit in cruising with a retarded throttle when I can't make 70% power even wide open ... etc. Just because you've done something a certain way for a long time doesn't mean it's correct. That chart may be "close enough" for your purposes, but it could still be off a bit. It always seemed fishy to me that the chart shows pretty high power output at relatively low RPM. I think the question is where do you want your WOT level max to be, and why? If you are pitched for WOT at 5500, you are pitched for best *continuous* cruise. This would be good for long distance travel. But if you pitched for 5650rpm, you'd have a higher rpm and thus make more power for climbing (escaping mountain waves? ), as well as having some "reserve speed". Your continuous cruise speed would be slightly lower, but you'd also be able to go WOT at 5650 and probably get a higher cruise speed than you have now, though only for 5min max and at a cost of higher fuel burn. For me, as a relative flatlander, it makes sense to pitch for higher WOT rpm. I get better climb, and if I travel I can climb to 7000-10000ft and still get full 5500rpm if I need to. It's all a balance game, and frankly splitting hairs a bit, you just have to decide what your personal "best" setup is. It seems you already have decided on 5500rpm WOT, so unless you want more climb or the capability to make short dashes at slightly higher speed, you are set. That was the primary decision I had to make back in 2006 and I opted for best continuous cruise speed over improved climb for take off (less than 5 min). 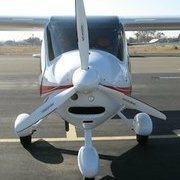 In the past my 180hp STC skyhawk proved to be a good performance minimum for climb performance that is so useful around here. My CT outclimbs the skyhawk at any reasonable pitch setting by a great margin so I knew from the get go that cruise speed is what I was aiming for. You and I pitch similarly but for different reasons. Best speed only becomes available in the thin air above 7,500 plus I spend most time up high plus down low its too noisy to go best speed. Your reasons are different but you are pitch almost as flat as me. 127kt TAS is almost exactly what I get at ~5400rpm. I can get 130kt but the fuel burn is high and it's not worth it. Fuel burn is high at 5500 WOT. Usually around 5.8 - 6.2 gph. I don't think Ed has a fuel transducer unless he had one installed later. When we set our props at 5600-5650 WOT and cruise at 5200-5300 fuel burn is about 4.8 - 5 gph. For me the extra couple of knots isn't worth the extra fuel.You might save a few minutes on a trip. I used to plan 5gph but over time I've gone to 6gph so I agree that WOT is that high. Consider WOT is full rich so leaning and altitude don't come into play, you would need a smaller main jet to get a proper mixture. Its not the flatter pitch that's getting you the economy because you are changing pitch in the wrong direction looking for economy but rather its the fact that you retard you throttle and get both a reduced power setting and a leaned mixture. Cruising at 10,000' it makes no sense to retard your throttle but you need to in order to bring the needle jet into play. Once I'm below 75% power available I want max power over leaning since I can't have both. I always plan for 6gph and usually burn 4-5.5gph. Glad you are here, Ed, providing first hand data, on operating that engine at the outter fringe of the power band. It says a lot about that engine and what it can take. I plan 5 gph and usually burn about 4.7 - 4.8. I would like to take this opportunity to apologize to my junior high math class. I sat in the back corner of the room and every time the teacher asked a question I jumped up and shouted out the answer. The teacher would say, "Mike, let's give someone else a chance to answer". But I kept doing it anyway. I don't think that was particularly helpful for my teacher, or for the other students in the class for that matter, some of whom were probably struggling with the subject and may have decided right then and there to avoid math forever after. But I couldn't stop myself. And I can't now either. Sorry Monkey. To say something is proportional to something else only indicates that there is some constant which when multiplied by the one will generate the other. It says the two curves have the same shape. It makes no claim that the absolute values are the same. You shouldn't worry that the cube of engine rpm is a big number. That doesn't affect proportionality. In fact, if delivered power is proportional to the cube of rpm it is also proportional to the cube of rps (revolutions per second). You can divide all the rpms by 60 before cubing them and have much smaller numbers to deal with if you like. A cube curve looks something like an aerobatic pilot pulling up into a hammerhead stall. 2 becomes 8. But increase it by just one more and 3 becomes 27, then 4 becomes 64 and so on. It’s climbing ever quicker. A cubed root looks something like instrument pilot approaching his assigned altitude. 125 becomes 5. Increase it by 1 and 126 is still almost 5. In fact, you have to increase it by 91 just to get up to 6, and then by another 127 to get to 7. It’s leveling off. When you double your rpm do you expect 8 times the delivered power (2 cubed), or just 26% more power (the cubed root of 2)? The cube curve makes more sense (though personally, I would have expected delivered power to be proportional to the square of rpm, just as the lift or drag of our wing is proportional to the square of airspeed). Alternately, you can just take the new rpm, divide it by 5800, cube the quotient then multiple that by 100. This is doing the same thing with the proportionality constant built in so you never have to see any big numbers.